The Bracelet Buddy® eliminates the frustrations, fumbling and difficulties associated with fastening even the most difficult of bracelets. The Bracelet Buddy's patented polymer clip secures one end of your bracelet allowing your free hand to wrap it around your wrist and instantly secure the clasp. 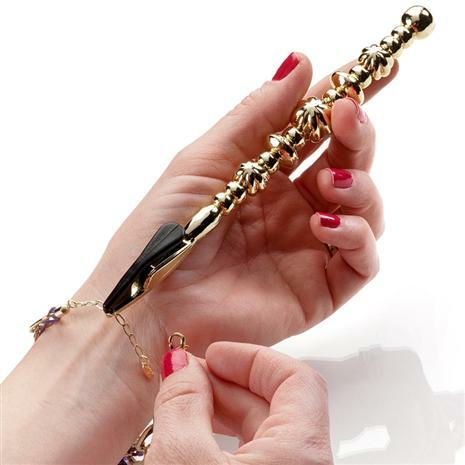 An absolute must for anyone who owns a bracelet. Works like an extra hand. Helpful for arthritis sufferers. The Bracelet Buddy® measures 7" and its design emulates hand-made Italian craftsmanship and features a lustrous gold tone finish that stands out even among your most beautiful jewelry. Comes with handy protective traveling case and instructions.